The Blue Period of Picasso is the period between 1900 and 1904, when he painted essentially monochromatic paintings in shades of blue and blue-green, only occasionally warmed by other colors. These somber works, inspired by Spain but painted in Paris, are now some of his most popular works, although he had difficulty selling them at the time. Picasso settled in Paris in 1904, having spent a few difficult years with no fixed studio and little artistic success. While back in 1903, he had produced his Blue Period works, which seemed to reflect his experience of relative poverty and instability, depicting beggars, street urchines, the old and frail and the blind. This period's starting point is uncertain; it may have begun in Spain in the spring of 1901, or in Paris in the second half of the year. In choosing austere color and sometimes doleful subject matter - prostitutes, beggars and drunks are frequent subjects - Picasso was influenced by a journey through Spain and by the suicide of his friend Carlos Casagemas, who took his life at the LHippodrome Cafe in Paris, France by shooting himself in the right temple on February 17, 1901. 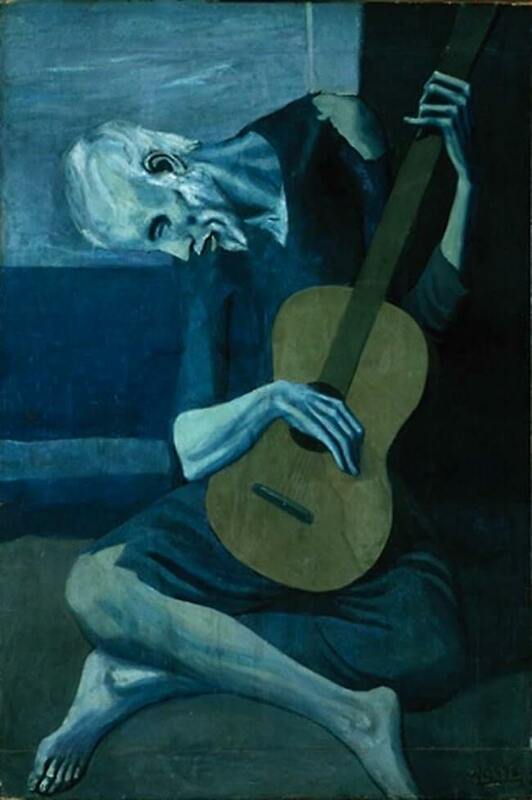 Although Picasso himself later recalled, "I started painting in blue when I learned of Casagemas's death", art historian Helene Seckel has written: "While we might be right to retain this psychologizing justification, we ought not lose sight of the chronology of events: Picasso was not there when Casagemas committed suicide in Paris ... it was only in the fall that this dramatic event emerged in his painting, with several portraits of the deceased". At this time Picasso was very open to artistic influences around him, and events of these years would have a major effect on his: the exhibition of Fauve works, particularly those of Henri Matisse. Picasso responded to the new avant-grade developments of the Fauve painters in Paris by exploring new directions himself, creating his ground-breaking style. Picasso's depression didn't end with the beginning of his rose period, which succeeded the blue period and in which the color pink dominates in many of his paintings. In fact, it lasted until the end of his cubist period (which followed the rose period) and only in the period thereafter, which was his neo-classicist period, did Picasso's work begin the show the playfulness that would remain a prominent feature of his work for the rest of his life. Picasso's contemporaries didn't even distinguish between a blue and a rose period but regarded the two as one single period. Starting in the latter part of 1901 he painted several posthumous portraits of Casagemas, culminating in the gloomy allegorical painting La Vie, painted in 1903 and now in the Cleveland Museum of Art. 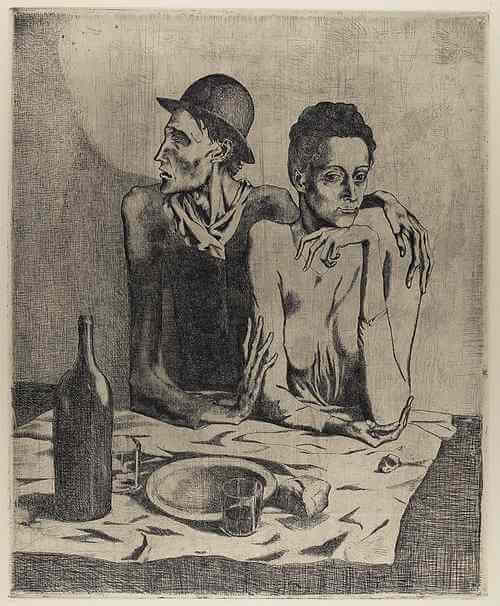 The same mood pervades the well-known etching The Frugal Repast (1904), which depicts a blind man and a sighted woman, both emaciated, seated at a nearly bare table. 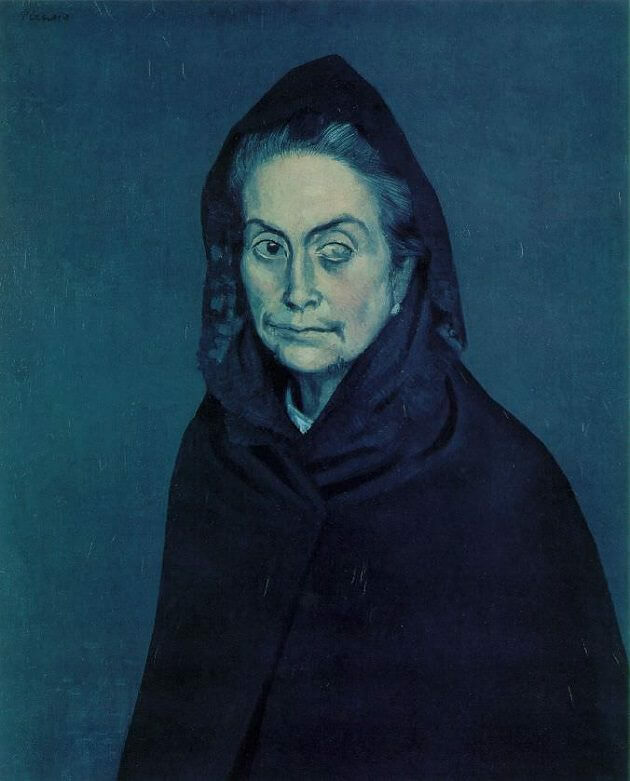 Blindness is a recurrent theme in Picasso's works of this period, also represented in The Blindman's Meal (1903, the Metropolitan Museum of Art) and in the portrait of Celestina (1903). Other frequent subjects include female nudes and mothers with children. A significant influence on Picasso's blue period paintings was his visit to a woman's prison called St. Lazare in Paris, where nuns served as guards. The Two sisters is an example of how Picasso used to mix daily reality with Christian iconography. The posture and gestures of the women were derived from the way artists depict the visitation, the color blue symbolizing Mary, the Mother of God. The meeting, or visitation, refers to the meeting between Mary, Mother of God and the mother of John the Baptist. 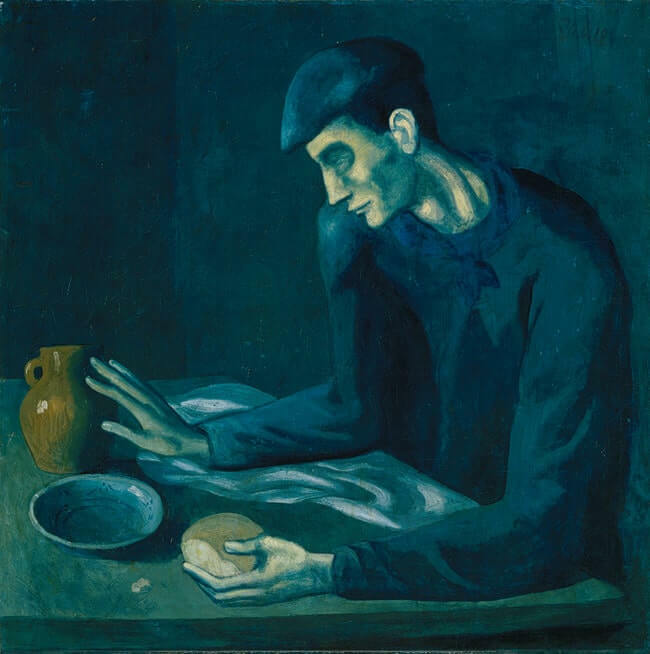 An ever returning theme in Picasso's blue period (and also in his rose period) is the desolation of social outsiders, whether they be prisoners, beggars, circus people or poor or despairing people in general. Not only did this theme answer to his blue mood, but it also answered to the zeitgeist (the spirit of the time) of the artistic and intellectual avant garde at the beginning of the twentieth century.